Protable Bluetooth Music Speaker. Karaoke System. PA System. Whether you're listening to music, having a karaoke party, or needing a simple PA system for a meeting, the KEYNOR RHM does it all! This all-in-one, wireless Bluetooth sound system produces powerful, crystal-clear audio with plenty of bass and volume.It features a total of three built-in speakers (two treble speakers + one dedicated bass speaker). Two wireless microphones are included. Each microphone has buttons to remotely control the microphone volume level, as well as music volume level, reverb level, and audio effect settings. The microphones have a 30 feet range and can easily be recharged using the included USB cable. Best of all, the KEYNOR RHM speaker is extremely portable. The convenient carrying handle makes it easy to take this compact system anywhere. (The handle also serves as a phone or tablet holder.) The long-lasting built-in battery works for up to 5 hours. At KEYNOR,we believe in our products. That's why we back them all with a 12-month warranty and provide friendly, easy-to-reach support. Powerful speaker system,2.1 All-in-one,long standby for 12 hours. 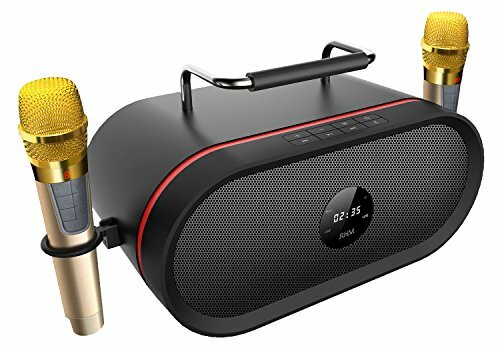 Small size and portable outdoor bluetooth karaoke speaker.AUX in/TF/USB/BT/Micro USB support many external device like mobile phone,Ipad,TV,PC. Two golden aluminum wireless microphone (2.4 GHz Frequency, 30 feet Range & Rechargeable),DSP technology to make the microphone more humane, so that your voice sound more pleasant ,bluetooth 4.0 connectivity plus iOS/Android app for expanded control. This product is can be used in many types of mobile phone singing APP,and suitable for broad usage in the KTV,enjoying music,the speech and the meeting. If you have any questions about this product by RHM, contact us by completing and submitting the form below. If you are looking for a specif part number, please include it with your message.